A not-for-profit organization, the Malta Conferences Foundation (MCF), was incorporated on 1 June 2011 in the District of Columbia for the purpose of organizing the biennial Malta Conferences, “Frontiers of Chemical Science: Research and Education in the Middle East.” These conferences were established to bring scientists from Middle Eastern countries together with the goal of using science as diplomacy to build a bridge to peace, tolerance, and understanding among the nations of the Middle East. The Malta Conferences, so-called because the first two (Malta I and II) were held on the Mediterranean island of Malta in 2003 and 2005, have more recently been held in Istanbul, Turkey (Malta III), and Amman, Jordan (Malta IV), in 2007 and 2009 respectively. In December 2011, Malta V will take place at UNESCO headquarters in Paris, France, as the last event at that venue in celebration of the International Year of Chemistry. IUPAC has been a cosponsor of the Malta Conferences since their start, supporting them intellectually and financially. IUPAC Presidents Pieter Steyn (2003), Leiv Sydnes (2005), and Bryan Henry (2007) attended the Malta Conferences in those years, representing IUPAC. Sydnes now serves as a member of the Board of Directors of the Foundation. The Malta Conferences have brought together scientists from 15 nations of the Middle East: Bahrain, Egypt, Iran, Iraq, Israel, Jordan, Kuwait, Lebanon, Libya, Palestinian Authority, Qatar, Saudi Arabia, Syria, Turkey, and United Arab Emirates. Many of these scientists cannot otherwise meet face-to-face because their governments are hostile to each other. Progress from the four earlier conferences can be measured in terms of the creation of a working group on Regional Water Quality Assessment with members from Jordan, Palestinian Authority, Israel, Egypt, and Kuwait (with advisors from the USA and European Union, and funding from IUPAC); the next step is to extend the project to Syria and Lebanon. In addition, multinational collaborative research projects on solar energy conversion and storage, and regional workshops on science curricula, laboratory materials, green chemistry, and chemical safety and security are in progress. Each conference is characterized by plenary lectures delivered by 5 or 6 Nobel Laureates (e.g., Aaron Ciechanover, Dudley Herschbach, Claude Cohen-Tannoudji, Richard Ernst, Robert Grubbs, Walter Kohn, Roald Hoffmann, Yuan Tseh Lee, Sherwood Rowland, Jean-Marie Lehn, Rudolph Marcus, Tim Hunt, and Ada Yonath). 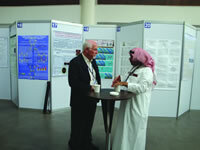 Workshops on topics of importance in the Middle East (e.g., alternative energy sources, nanotechnology and material science, medicinal chemistry and natural products, environment: air and water quality, and science education at all levels) and poster sessions are conducted at which approximately 90 participants can display the results of their scholarly activities in an open and collegial forum. Articles about the previous Malta Conferences have been published in the U.S. Congressional Record, Chemical & Engineering News (ACS), Chemistry International (IUPAC), Chemistry World (RSC), and the Washington Report on Middle East Affairs, among others. Links to these articles can be found on the MCF website. The MCF officers, Zafra Lerman (president), Ann Nalley (vice president), Paul Walter (vice president), Howard Peters (secretary), and Morton Hoffman (treasurer) are members of the Board of Directors. The Foundation is dedicated to obtaining funds to support Malta V and future conferences from private and government agencies and foundations, scientific societies, and individual and corporate contributors. Details about making a personal contribution can be found on the MCF website.